Problem: The Emergency stop loop has been tripped. The emergency stop loop is run through all of the motors as well as the E-stop button. It must be determined which segment of the E-stop loop is broken. 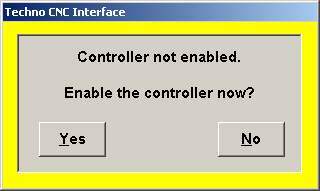 Solution: Before doing any work on the machines, switch off and lock out power to the control box. ›Check all cables going into motors. Ensure they are completely engaged and screwed in tightly. ›Check all cables going into the control board inside the control box. Ensure they are completely engaged and screwed in tightly. If the problem persists, you will next need to isolate the problem. Record which pins already have jumpers on them. This will be critical information later. 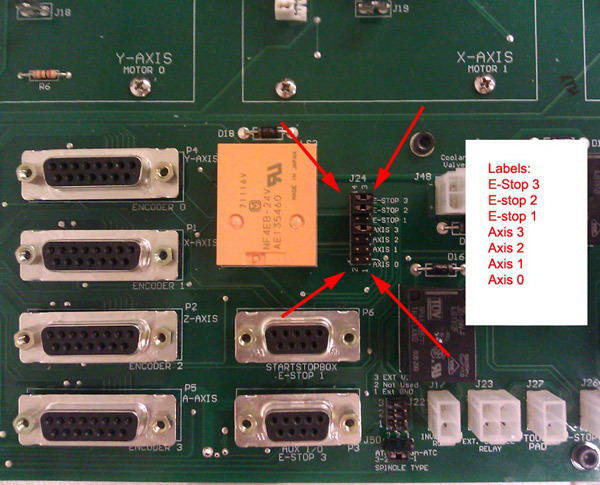 Label this list "Original E-Stop Jumpers"
Place jumpers on all of the headers. Power up and enable the machine. It should jog properly now. Power up and enable the machine. If it jogs properly, power down and remove another NEW jumper. Once you have removed the jumper that causes the machine to no longer enable, you have found the cause of your problem. 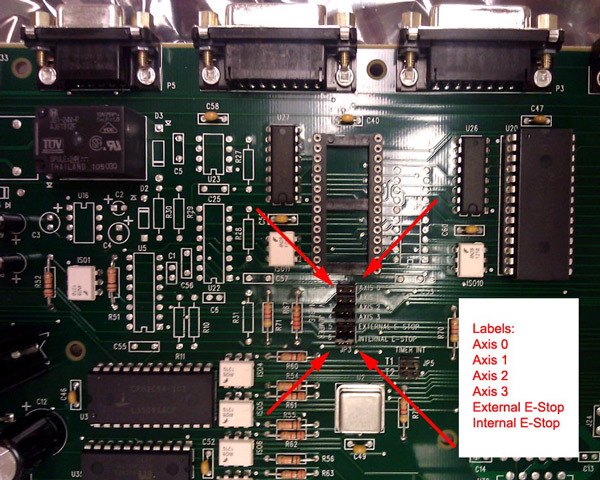 If the jumper removed was for an axis, while the machine has its power locked out, closely inspect the rectangular cable that goes to the motor and the subsequent cable at the control board. Are any pins bent or shorter than others? Does the cable appear damaged along its length? If the jumper removed was for an Emergency Stop, inspect the wiring inside the Emergency stop box. It is likely loose or broken. After repairing the problem, be sure to restore the original state of the jumpers. You may be tempted to run the machine with all of the jumpers in place instead of fixing the cause of the problem. Note that this is a dangerous practice, as the machine cannot sense lost feedback and could result in an extremely high speed runaway axis. 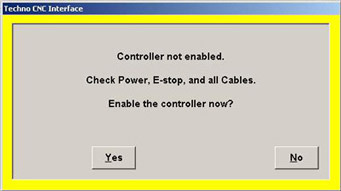 If you are unable to locate the cause of the E-stop problem, contact tech support.